Over the past couple of weeks, Apple’s focus on trade-in promotions has sparked further speculation about weak sales. First off, the company started with an online campaign. This was then expanded to physical stores over the weekend. And now, in the hope of making the process much simpler, Apple has added a new comparison page to its website. This web page displays the iPhone XR, iPhone XS, and iPhone XS Max alongside their respective prices. However, users are given the option of selecting one of thirteen eligible devices to trade-in – any iPhone released between September 2012 and September 2017 is valid. 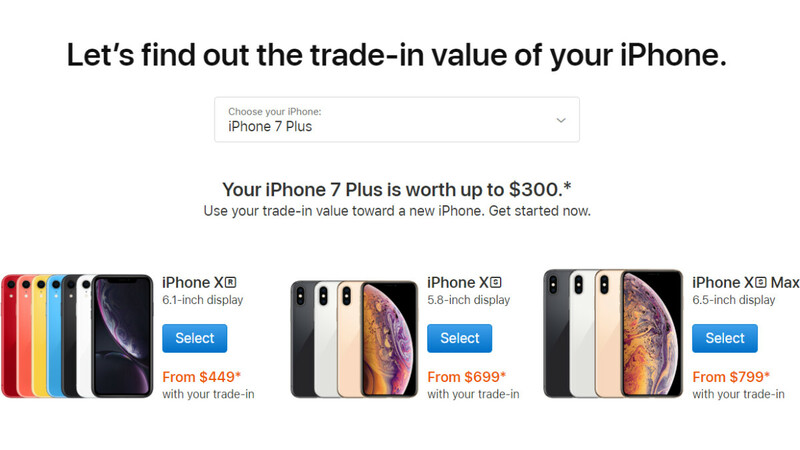 Once chosen, the page automatically deducts the device’s trade-in value from all three current-gen iPhones. For example, selecting an iPhone 7 Plus reduces the iPhone XR, iPhone XS, and iPhone XS Max prices to $449, $699, and $799 respectively. Alternatively, if 2012’s iPhone 5 is chosen Apple will reduce the prices ever so slightly to $724, $974, and $1074. At the moment, Apple is offering extra trade-in credit when an iPhone 6, iPhone 6s, or iPhone 7 model is replaced. This has been available for almost two weeks now, despite it being advertised as a limited-time offer. And with the company yet to confirm when it’ll end, it looks as though it could continue to be available until Christmas or even the end of the year in the hope of attracting festive buyers. It's kinda sad to see how Apple is snooping so low to get sales. This is what they get for unreasonable prices, although I gotta admit they've got some amazing products. Did you notice that phonearena posting iPhone's promo at least twice everyday lately. Looks like they really desperate to help their master, lol.. Desperation, try everything to keep shareholders and market cap high. I remember when apple fanboyz talking crap when android manufacturers doing this type of advert, now look at their precious lord and savior begging folks to buy these trash. Who's laughing now heh? But the analyst's and Apple cheerleaders said Apple was due for a super cycle. Not so much so. Apple you are too smart lol. WHERE IS THE ORIGINAL IPhone X, the first X. Ahhahaha. Loving the trade in values, I think I'll switch to Apple temporary, but 64gb isn't going to cut it for me. it looks like it's working what they are doing, sales speed for XR been growing.https://mixpanel.com/trends/#report/iphone_Xs/from_date:-101,report_unit:day,to_date:0 Looks like people are starting to see what a great phone it is.